Welcome to Borley Rectory, the most #haunted_house in #England. The year is 1926 and Sarah Grey has landed herself an unlikely new job – personal assistant to Harry Price, London’s most infamous #ghost hunter. 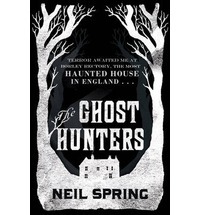 Equal parts brilliant and charming, neurotic and manipulative, Harry has devoted his life to exposing the truth behind England’s many ‘false hauntings’, and never has he left a case unsolved, nor a fraud unexposed. Free shipping worldwide on all books!